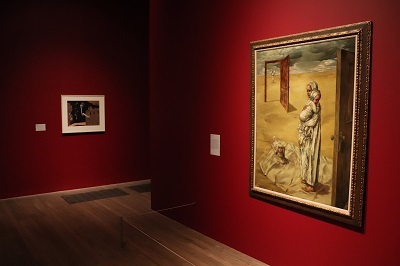 Tate Modern presents a major exhibition of the work of American artist Dorothea Tanning (1910-2012). The exhibition is the first large-scale exhibition of her work for 25 years and the first ever to span Tanning’s seven-decade career. 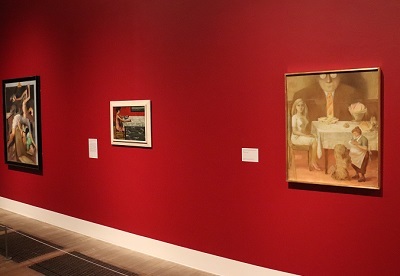 The exhibition brings together around 100 works from around the world and includes over a third of which are shown in the UK for the first time. 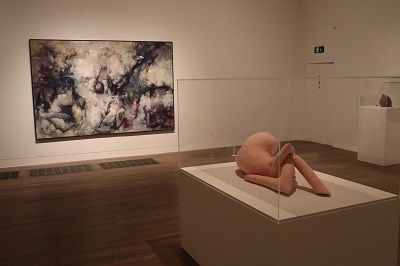 Tanning worked in a range of media from paintings, drawings, stuffed textile sculptures and installations. 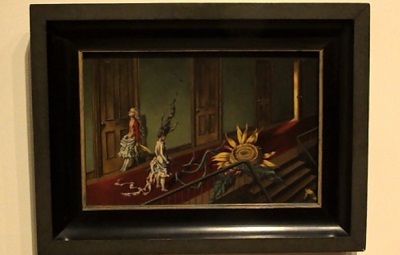 Dorothea Tanning was born in 1910 in the small town of Galesburg, Illinois and was fascinated by Gothic and Romantic literature. In the 1930s, she decided to move to Chicago then New York to pursue her artist career. She first encountered surrealism in New York in the 1930s and was instantly attracted to exploring the subconscious in her work. Tanning met German painter Max Ernst in 1942 and they married in 1946. 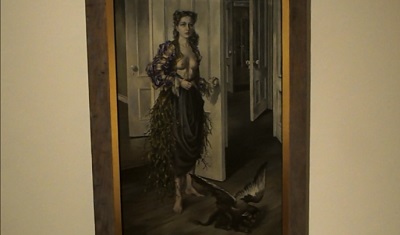 Tanning began to plumb her own subconscious depths with early works that takes ordinary domestic scenes and introduces gothic scenes that are full of strange imagery. Works from this period such as Children’s Games 1942 and Eine Kleine Nachtmusik 1943 are full of suppressed desires and burgeoning sexuality where open doors represent portals to other places. Tanning applied these types of symbolism to self-portrait Birthday 1942 which she believed marked her ‘birth’ as a surrealist. Doors and domestic settings became common motifs in the early part of her career with works like La Truite au bleu (Poached Trout), Some Roses and Their Phantoms and Portrait de famille (Family Portrait). Tanning held a life-long passion for dance, music and performance and produced set and costume designs for ballets by George Balanchine and John Cranko in the late 1940-50s. 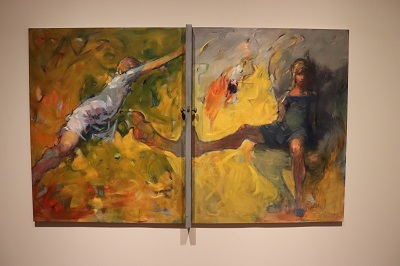 These are shown with a series of dynamic figurative paintings such as Tango Lives 1977 that explore movement and sensuality. 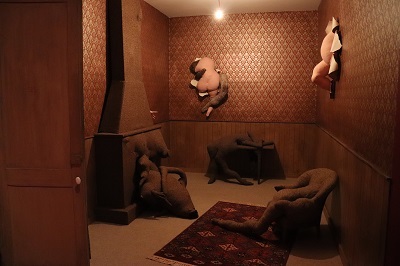 In the mid-1960s, Tanning used her Singer sewing machine to make a highly original ‘family’ of soft sculptures that are a main focus of the exhibition. These hand-crafted sculptures are often like body parts that become contorted and intertwined objects. Works like Étreinte 1969 and Nue Couchée 1969-70 illustrate these transformations as does the remarkable room-sized installation Chambre 202, Hôtel du Pavot 1970-3. After the death of Ernst in 1976, Tanning returned to New York and experimented with her soft sculptures that became objects that straddle the line between playful and sinister. Her later paintings followed this idea of transformation where bodies and nature merge in Poppies 1987 and On Avalon 1987. 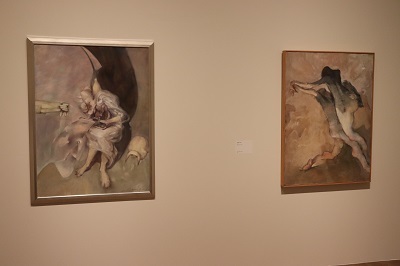 This fascinating exhibition takes viewers into the strange and wonderful world of Dorothea Tanning. Her style is similar to Salvador Dali but with a Gothic twist that creates worlds full of symbolism and unconscious desires. 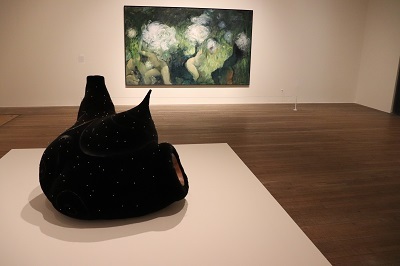 Tanning is not widely known in the UK and this exhibition offers the viewer to explore her extraordinary career. In many respects, her strange worlds are oddly familiar which suggests she was perhaps ahead of her time and something of a pioneer. By londonvisitors2014 in Exhibitions on February 26, 2019 .